Euan Mullock in World Affairs on 26 February, 2017. A decade ago Venezuela was one of the richest countries in South America, untouched by the inflation that ravaged Argentina, the political paralysis that affected Chile and the cocaine crisis that was damaging neighbouring Colombia. Flush with oil money – which was at that point selling at an all-time high – petrol was able to be provided for citizens at a couple of cents (and cheaper than water) – education and healthcare was free, and millions fewer Venezuelans were living in the poverty that had blighted the country in the 1990s. Ten years later and some of the stories coming out of Caracas are unbelievable – the country leads the homicide and inflation world rankings, is increasingly regarded as a “failed state” with only the brave venturing out after dark, and queuing is becoming such a way of life that murders have been reported of those brave enough to queue-jump, and an incredible story about a woman giving birth while waiting her turn for a supermarket. Since coming to power in a “Bolivarian Revolution” in 1999, the ruling Venezuelan United Socialist Party (PSUV) has been headed by two strongmen in Hugo Chávez and his protégé Nicolas Maduro; credited by their supporters for increasing the country’s oil income and providing a better standard of living than ever before for its citizens. Vowing to rid his country of “colonialism”, Chávez nationalized industries, invested in infrastructure and championed the poor of his country, riding to successive electoral victories against a weak and demoralized right-wing opposition. However, his critics argued that democracy in Venezuela was slowly eroding under his tenure, not helped by the fact that Chávez had tried to seize power in 1992 under a coup d’état and had strong links with the country’s military. As his presidency went on, the distinction between the legal systems, its courts and the central government became increasingly blurred, as Chávez packed the country’s law institutions with his loyal supporters – chavistas – up and down the country. Since his sudden death in 2013, the country has lurched from crisis to crisis under his designated successor President Maduro, who narrowly won election in his own right at the end of the year, with power outages and food shortages becoming a part of everyday reality since the transfer of power. 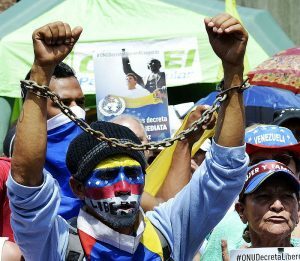 A collapse in the oil price has left Venezuela struggling to pay its bills and its previously generous welfare state, with depleted currency reserves and the country’s inability to import goods fuelling a rise in economic troubles. Inflation has soared to 800% (and estimates point to a figure of 1,600% in 2017), which meant that until last month, the highest-value Venezuelan banknote was worth just 2.5p on the black market. New banknotes have failed to stem the problem, with Venezuelans having to carry fistfuls of cash and shopkeepers weigh banknotes for even the most basic (and hard to get) necessities. ATMs restrict transactions and withdrawals to just a few dollars a day, completely unworkable in a country where prices increase daily, if not hourly, reminiscent of the hyperinflation seen in Weimar Germany, and more recently, under Mugabe’s Zimbabwe. For his part, Maduro has blamed his country’s woes on the United States, making up stories of an “imperialist attack” on Venezuela being responsible for the economic crisis. For years now, Venezuelans have been trying to oust President Maduro, who has been suffering from record-low opinion polls. Venezuela allows for its presidents to be recalled by following an electoral process codified in the country’s Constitution, but Maduro and the left-leaning Constitutional Court have gone to extraordinary lengths to prevent this democratic right from happening. From ignoring petitions to bringing forward recall deadlines, the legal opportunity to turf Maduro out before the next Venezuelan election in 2018 has now passed. 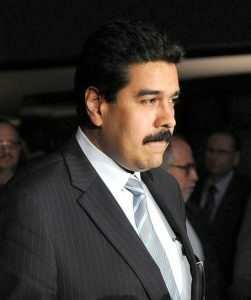 Although Maduro’s approval ratings have sunk to below 20% and shortages of even the most basic of items – including bread, toilet paper, milk, medicine and meat – have led thousands of Venezuelans to turn to nature to live, surviving off the ubiquitous, humble mango (depressingly nicknamed the ‘Maduro Diet’), Maduro has managed to cling on to power through any means necessary, and against the wishes of the majority of his countrymen. Throughout his tenure violent crime has soared to record levels, turning cities and their barrios into no-go areas, with almost 30,000 murders reported in 2016 alone, a figure which is set to rise this year. Supermarkets are regularly broken into, even if their shelves and aisles remain empty, and homes raided by poverty-stricken Venezuelans searching for any food. For years, the border between Venezuela and neighbouring Colombia was one that normally saw Colombians fleeing the violence and economic problems of their homeland to their rich neighbour, but now almost all trade and flow of people is exclusively in the other direction. 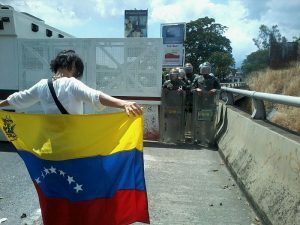 That is, when the Venezuelan authorities allow the border to be open, citing ‘smuggling’ and ‘sabotage’ as reasons to prevent its citizens from leaving in search of food and basic goods.Sadly for everyday Venezuelans, despite the protests which have paralyzed the capital Caracas for months, the millions of recall signatures, and the worsening economic, security and political situation, they will not get a chance to vote out their unpopular and ineffective President until 2018 at the earliest. Inflation continues to spiral out of control, and life’s necessities are increasingly even harder to come by, for all but the wealthiest of Venezuelans. And even those who can afford – for the moment – life’s “luxuries”, such as a foreign holiday, have recently been dealt a blow. Venezuela just ran out of the plastic needed to make new passports. This crisis has been going on for years now – and sadly there’s no end in sight.